In Dr. Sherry Mayo's article, "The Prelude to the Millennium: The Backstory of Digital Aesthetics" on the early influences and foundations of digital culture, I was surprised to read that she traced the foundations to the 1960's. Living as we do in the age of Digital Convergence, perhaps some researchers choose to look no farther than mid-20th century or to narrowly define the underpinnings of digital culture to that which was "born digital". 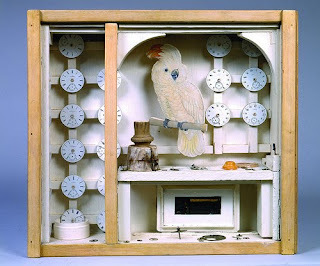 This approach omits Joseph Cornell, an self-taught artist who was working in the area of mixed media, visual cross referencing, film, and image appropriation, and who began showing his work at New York galleries and museums in the 1930's. Any serious discussion of image repurposing, visual metaphor in multimedia, or an art historical context for digital media would have to include Cornell. He was both a visual poet, and the artist as "a type of Merlin- a trickster magician" figure that she alludes to. The link provided is to an online exhibit presented by the Peabody Essex Museum and the Smithsonian Institute from the exquisite 2007 exhibition called "Joseph Cornell: Navigating The Imagination." I will never forget it. Bro, can you spare a cell? 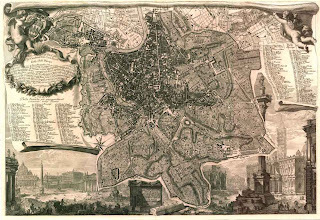 In 1748, Giambattista Nolli, made one of the most accurate ichnographic (ground plan) maps of Rome, the Pianta Grande di Roma commonly known as the Nolli Map. Pope Benedict XIV commissioned the map in order to survey Rome, and ever since then this map has been used for government planning as recently as 1970! You can see an "interactive" Nolli map here. “Have you used it much?” I inquired. The map below shows the movement and concentration of mobile phone users during important events in the city of Rome. In this case the events happen to be the controversial Madonna concert and the World Cup final between Italy and France. See a big version of this movie here where you can actually see the timeline.